Donegal Rapeseed Oil with Lemon for frying. Sieve the flour into a bowl, add sugar and make a well in the centre. Beat the eggs and milk together and gradually add to the bowl. Whisk together to form a batter consistency. Add Donegal Rapeseed Oil and transfer to a pouring jug. Heat the pan on a medium heat and drizzle with lemon oil. Add the mixture into the centre of the pan and allow it to flow outwards. Cook until light brown in colour and turn over. 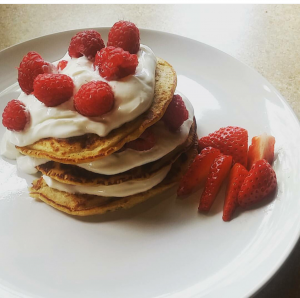 Drizzle with honey and a squeeze of lemon or with fresh berries & yogurt. Whisk in the eggs and honey then gradually whisk in the buttermilk and 1 tbsp Donegal Rapeseed Oil to form a thick batter. Heat a little extra oil in a frying pan and using a tablespoon, spoon some mixture into the pan to make 4 pancakes. Repeat to make 12 pancakes. 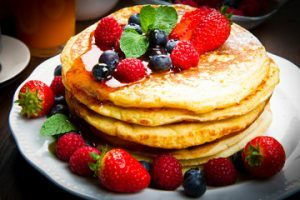 Ideal drizzled with syrup or honey and topped with fresh berries. 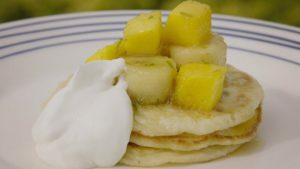 Hotcakes with Mango & Banana Saute. – 1 tbsp of maple syrup. Put the flour, baking powder and salt into a bowl. Make a slight dip in the middle and crack an egg, then add buttermilk and mix until smooth with a fork or small balloon whisk. Finally stir in the desiccated coconut. Put a large non-stick frying pan over a medium heat. Add a little oil, removing any excess with kitchen paper. Spoon three tablespoons of batter into the heated pan and cook for one to two minutes, until little bubbles rise up to the top. Using a spatula, carefully flip over and cook for another minute or so, until golden on both sides. When the hotcakes are done, transfer them to a plate and cover with foil to keep them warm. Wipe the pan with kitchen paper and add a little more Donegal Rapeseed Oil. Continue to make hotcakes with the rest of the batter. You should make about 12 hotcakes. Once all the hotcakes have been made, wipe out the frying pan with kitchen paper and add the butter. Once the butter is melted and sizzling, tin in the mango and bananas, tossing to coat. Saute for two to three minutes, until heated through and just beginning to caramelise. Drizzle over the maple syrup or honey and lime juice, and continue tossing until evenly coated. Arrange three hotcakes on each serving plate. Add a spoonful of yoghurt to each one and spoon over the mango and banana saute to serve.